Doc Rat Vol. 13 and 14, by Jenner – Book Reviews by Fred Patten. Doc Rat. Vol. 13, Lucky for Some, Doc, by Jenner. Melbourne, Vic., Australia, Platinum Rat Productions, June 2014, trade paperback A$16.00 (unpaged [76 pages]). Doc Rat. Vol. 14, Prey Tell, Doc: Son of Fortenflanck, by Jenner. Melbourne, Vic., Australia, Platinum Rat Productions, December 2014, trade paperback A$16.00 (unpaged [88 pages]). 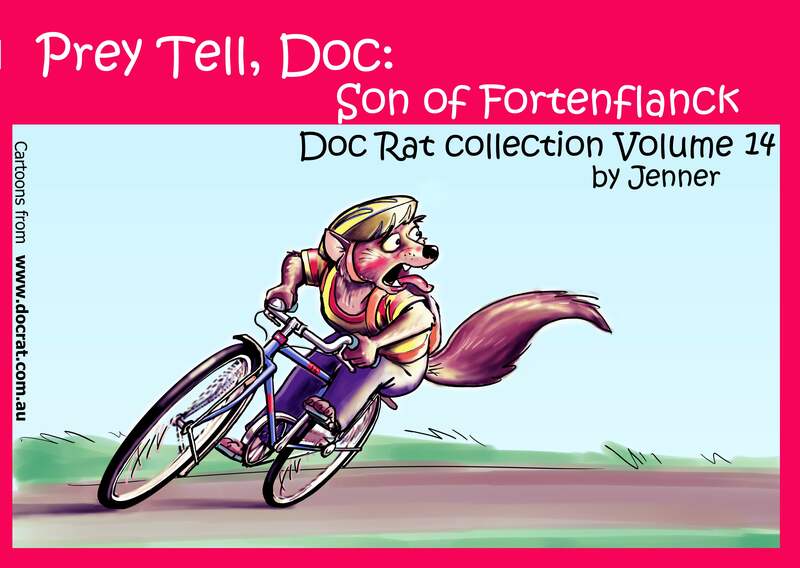 These are the latest two pocket-sized volumes of Jenner’s Doc Rat online daily comic strip. They are especially desirable right now when the Doc Rat website is having electronic problems, so you couldn’t read these strips for free on its archive if you wanted to. But even when the archive comes back online, these thin booklets are extremely handy for carrying around with you. They are only available in one bookshop in Melbourne, and by mail order over the strip’s website for A$16.00 or US$12.95 each. They are highly recommended. It’s no secret today that Jenner is Dr. Craig Hilton, a general practitioner in a suburb of Melbourne. Dr. Benjamin Rat M.B., many etc.’s, is also a GP in a suburb of the Australian animal city of Fornor. Jenner began Doc Rat in June 2006, and like any long-running comic strip, it has a wealth of backstory and supporting characters by now. It helps if you are familiar with them, but it’s not essential; just as it isn’t essential to be familiar with the medical profession to appreciate all the technical references that Doc Rat and his staff plus others (Gizelle Thomson, his Thomson’s gazelle office receptionist; Mary Scamper, his motherly rabbit nurse; and numerous pharmaceutical high-pressure salesmen) casually throw around. Doc Rat has his own GP practice, and most of the situations that he faces are shared by any small business: billing, paperwork, keeping up with the latest developments in your specialty, and so on. Since this is an Australian funny-animal strip, be prepared to meet many anthropomorphized Aussie animals. Not only the expected kangaroos, koalas, and wombats, but numbats, bilbys, Aussie possums (which are very different from North American opossums), and more. Jenner loosely alternates between two types of story continuity; a long string of stand-alone strips, usually set in Ben’s doctor’s office, featuring gag-a-day humor heavy on puns, and more serious human-interest strips featuring Ben and his wife Daniella and their acquaintances in Fornor. Jenner often pays attention to his species’ natures, with some of Doc Rat’s adventures involving rescuing his herbivorous friends from predatory carnivores. As Japanese cartoonist Osamu Tezuka pioneered, some stories deal with him helping friendly carnivores who are trying to live peacefully with their herbivorous neighbors without starving to death. Volume 13 contains strips #1759 to #1854; March 21, 2013 to August 1, 2013. Volume 14 contains #1855 to #2010; August 2, 2013 to April 11, 2014. This breakdown is a bit unusual. For the first time in the strip’s history, the two types of story continuity do not divide into reprint collections neatly. Volume 13 starts with a barrage of one-off groaner strips in Ben’s office, mainly featuring puns. But that sequence ends early and is followed by a new, very long and very serious story. Jenner did not want to either publish a very short volume 13 or to segue into his serial but break it off almost as soon as it started. His solution has been to work his notes on the “secret rabbit language” that he has been developing in bits and pieces in the strip over the past few years into an 18-page appendix on “How to speak Rabbit – a guide to Jennerverse Lapine”. Jenner started out making up a few exotic-sounding nonsense words for story purposes, and has gradually built them up to a coherent rabbit language that rivals the one in Richard Adams’ Watership Down (which he acknowledges). Volume 14 begins the long, serious story (“May be unsuitable for children. Contains adult concepts.”) that is a followup of sorts to an earlier sequence in volumes 8 through 10. Fangripp Jaegermond, a wolf, fell in love with Jasmine, a rabbit, after he ate her first husband. He eventually decided that he was “a rabbit in a wolf’s body”, adopted the name Flopsy, and married Jasmine; to the consternation of both families. Ben Rat helped Flopsy with his diet crisis, and got mixed up in getting both families to agree to a peace. In the new story that begins in vol. 14, the peace turns out to be an uneasy truce. Some wolves are satisfied with it for social/political reasons, while others think that “Flopsy” is a disgrace to the wolf name. His brother-in-law Fortenflanck, who holds himself to be above Flopsy in the wolfpack hierarchy (he isn’t), considers it his duty to bring Flopsy back from rabbitdom. Meanwhile, Fortenflanck’s son Simon, who is thirteen years old, is about to undergo the wolves’ rite of manhood which involves making his first kill; but Simon wants to become a doctor like Ben, which means saving lives … it all gets complicated. Ben’s wife Daniella is at the end of her pregnancy and … it’s really complicated. That’s why vol. 14 is longer than usual. It ends with a “to be continued”, but the story breaks naturally here with a relaxation from an emotional high. Whew! The cover showing Simon on a racing bicycle is a giveaway to this story’s breakneck speed. The secret rabbit language plays an important part in … oh, just get it! It’s a small booklet but fully worth the $12.95. Thanks for the review, although in my case extra exposure was unnecessary; I already know about this and have it on “to read later” list.